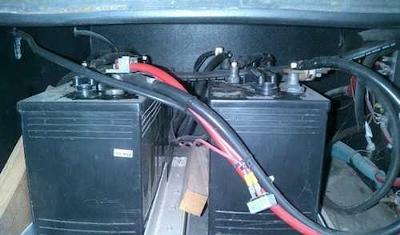 The difference between a deep cycle battery and a cranking battery is quite obvious. The output from the first one is a steady flow of current over a long time, whereas the second one produces a high-level of current for a short spell, normally to crank a motor to start. There are also dual purpose batteries like AGM batteries which exhibit marine cranking amperes, cold cranking amperes and reserve capacity data. Generally the motors installed on the homemade electric car will exhibit the cranking amperes required for the motor in the starting stage. The battery of a wet cell operates through a system of regular service by opening and adding water, when the water contents get evaporated during the heat up process. The cells in the battery should remain immersed in water-acid-liquid as otherwise; the battery may dry up and stop operation. As the acid does not evaporate during the heat up process but the water does, the water level should be maintained through a regular service. In the wet cells, acid water mixture may sometimes run out and any eventual leakage of acid may cause several damages. Therefore the sealed, leak proof wet cell batteries are preferable, as they do not require regular water service. Leak proof batteries like Gel Cell and AGM batteries can be stored in any position. The AGM battery always has an edge over gel-cell and wet-cell batteries. The battery load itself will indicate the exact type of deep cycle battery needed. A cranking battery is much ideal for operation, if it is used for starting and maintaining a few electrical functions. A deep cycle battery is useful for powering trolling motor and electronic devices. But the AGM batteries rule supreme in DIY electric cars, as they are sealed and can be stored anywhere. Two such batteries can also be joined and put in position to draw more power if they are of the same amp. If the amp differs; one of the batteries joined can get damaged easily. Another important factor is hooking of the batteries. Two batteries of the same volts are hooked together by joining the positive to the positive terminal and negative to the negative terminal, which is called parallel wiring. By doing so the volt remains the same while ampere output doubles. Similarly, by joining the positive to negatives of the other battery and vice-versa as in a flash light, the volts may double but the ampere will be equal to that of one battery. This is called series wiring. Normally the ampere rating of a 6V battery is higher than a 12V battery of the same size. By series wiring of two 6 volts batteries, 12V power with higher amperage is achievable, unlike a single 12V battery that will have lesser amperage. Hence as a safe measure, more number of low volt batteries are used in golf carts etc. Charging of batteries too has different options out of which, automatic multistage system is most ideal. Ruling out the possibility of an over charge. Though a car battery can be used in an EV, a deep cycle battery is superior service as they are manufactured to match the load requirement of a high torque electric motor. They are mostly duel purpose batteries, sealed and made leak proof. AGM batteries provide high output of power with low internal resistance compared to other batteries. That is why they are widely in use by the DIY electric car enthusiasts.